Later that year Duluth’s park board commissioned John Busha to build a new bridge within Lester Park. A native of Green Bay, Wisconsin, Busha was born to an Ojibwe mother and a French-Canadian father in 1847. Busha served in the Civil War with the 12th Wisconsin Infantry, the “Marching Twelfth,” which in 1864 joined General William Tecumseh Sherman on his notorious March to the Sea. According to Ojibwe historian Christine Carlson, in 1864 Busha returned to Green Bay and married Rosalie Aino, also of French-Canadian descent, and together they had seven children. Little is recorded about Busha’s life in the 1870s and 1880s. 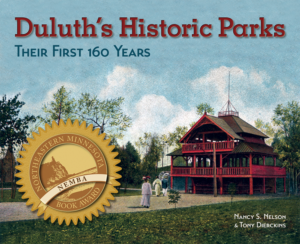 In 1893 he moved his family to Duluth and later found employment as Lester Park’s first park policeman. Along with Frank Hodges, Busha is thought to have been an early proprietor of Lester Park Pavilion/Harmonie Hall, which included a confectionary. Busha’s two oldest sons, Abraham and George, worked in the confectionary. In the winter of 1897 to 1898 Busha, along with Abraham and George, set to work felling some of Lester Park’s cedar trees and using teams of horses to haul them to a site along the river in preparation for building the bridge. Then the Bushas started putting the unpeeled logs together until they spanned the river. Finally, Busha adorned the masterwork by carving Ojibwe embroidery designs into the wood. According to Abraham Busha, their efforts earned the three men a total of $345.68—less than $10,000 today, and the materials cost nothing. The Lester Park Rustic Bridge became a popular tourist stop, with picnic tables on the bottom deck and lounging on the upper promenade. The lower deck even featured large square viewing holes (surrounded by rails) that allowed picnickers to look down on the Lester’s roiling brown water rushing past on its way to Lake Superior. Each summer ladies’ groups from local churches rented space in the lower level and sold refreshments. In 1899 noted American photographer William Henry Jackson visited Duluth, photographing landmarks for the Detroit Publishing Company. 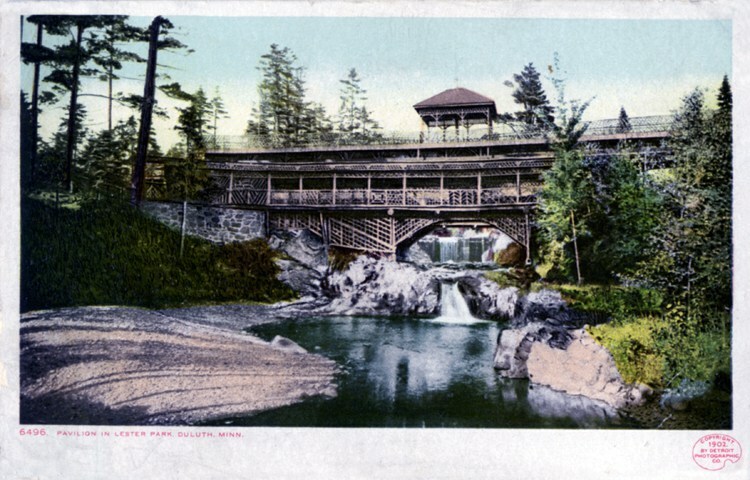 The photo he took of the Lester Park Rustic Bridge was made into a color lithographic postcard (below) in 1902. 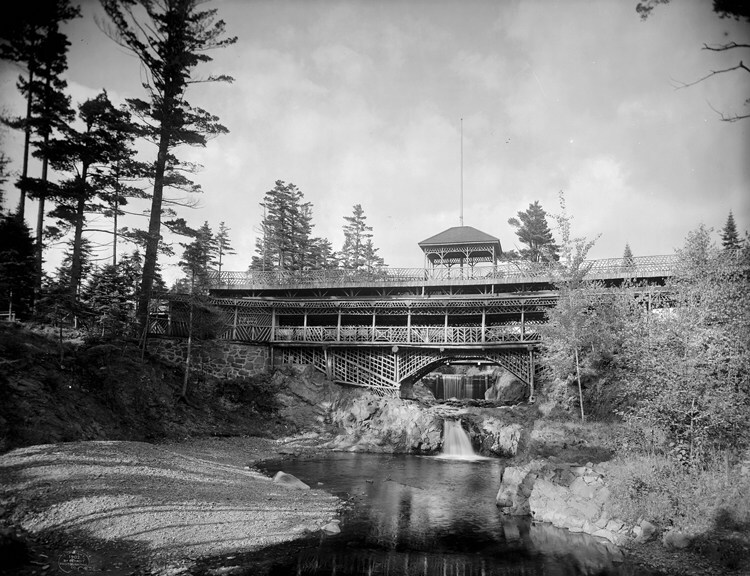 It was the first of many: During the golden age of lithographic postcards, approximately 1900 to 1939, the rustic bridge over the Lester River was Duluth’s second-most-popular postcard subject, second only to Duluth’s aerial bridge. Unfortunately, nature took its toll on the wooden bridge, and the upper deck had to be removed in 1916 due to safety concerns. In 1931 the lower deck met the same fate. When the bridge came down, only Abe “Candy” Busha survived as one of its original builders. While he had learned his trade at Lester Park’s Harmonie Hall, the second-eldest Busha son had earned his nickname as the confectioner of the Oatka Pavilion on Minnesota Point, which was destroyed by fire in 1909. The Oatka fire, like the 1913 conflagration that destroyed the Lester Park Pavilion, was reportedly started by an unattended cigar or cigarette. Candy Busha later worked as a janitor at Duluth’s City Hall.